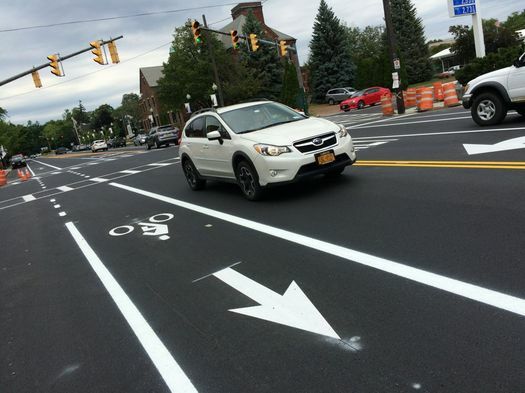 Since the new striping has gone down on the section of Madison Ave starting at Allen Street this week, we've heard a lot of comments from people hailing the traffic calming project for slowing vehicle speeds and providing bike lanes. So at the city of Albany's official unveiling of the project's first phase Thursday afternoon, we talked with city officials about these complaints. They urged patience as construction continues and they work out the snags. But they also called for people to adapt. One of the most important aspects of the Madison Ave Road Diet project is something that will be mostly invisible to many people: How the traffic signals from Allen Street to (eventually) Lark Street are synchronized. You can ignore the middle two columns, because those were based on a different situation that didn't end up coming to pass. The columns to focus on are the first and last -- the first one shows the performance of the street's existing four-lane design without signal synchronization, and the last column shows the three-lane configuration (like what ended up being implemented) with signal sync. The report projects an increase in delays (and travel time in one direction), but it's relatively small. 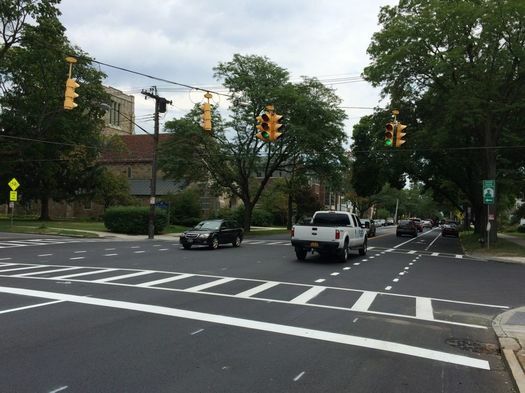 On Thursday Albany city traffic engineer Bill Trudeau said the first phase of the road diet -- the section of Madison Ave from Allen to Partridge -- has gotten some temporary synchronization work, and "more reliable timings" will be in place by the end of this year. Trudeau said the city will "absolutely" be monitoring traffic flow and will make adjustments based on what it finds. "This shouldn't be a speedway in and out of the city"
We mentioned the complaints about backups to mayor Kathy Sheehan. And she pointed to the construction that's in progress and the work on synchronizing signals. But she also said drivers will have to adjust. "There are people who might say 'my commute was shorter' because they were going 40, 45 miles an hour flying down this road. This is a road that is for everyone. This is a road that includes a place for cyclists, a place for pedestrians, an ability for people to cross this road more safely because of the turning lane. So the purpose of this is to get people to recognize this isn't a raceway ... it's a 30 mile per hour city residential street." "We live in a city. People can't say I'm going to make it somewhere in 10 minutes. They have to take other things into account." Police chief Brendan Cox was a little more blunt in his assessment of the situation so far: "People need to calm themselves down a little bit." Cox said the APD will be focusing on education related to the road diet project, because in his view, people will do what's expected of them -- if they know what's expected. "We need to do some education on this. Because certainly people are going to come into this who have never been on a stretch of road that has the bicycle lanes, so people need to know what's expected of both the driver and bicyclist -- what they should see, how they should act and maneuver. And then, behind that, if we need to do some enforcement, then we do that. But I think we do best when we do things through education." Cox said his department -- which includes traffic engineering -- is open to feedback. So if people have complaints or ideas, he wants to hear them. "So, it's going to take some time. And I know people will be a little frustrated. But I just ask for a little patience." The city has gotten $1.4 million from the state for the second phase of the Madison Ave Road Diet, from Partridge to Lark. Bill Trudeau -- the city traffic engineer -- said the hope is to have that second phase finished by the end of next year. He said the state money will cover the signal upgrades and striping -- the city's just waiting on sorting out the funding for repaving that section. So, what are the expectations for actually completing synchronization? ANy date(s)? Battle for synching Washington ave. ext. three lights is entering its second year. Results are pretty humiliating for DOT.. I think this project is great and will make the city more livable and safer. We need to keep in mind that motorist share the road with cyclists and pedestrians. This project will have a profound impact on people with disabilities and there ability to cross this major roadway safely. I hope we see more projects like this in the future. . It's pretty bad. Traffic at peak times is a sh*t show. I don't understand why some people supported this. Did they think it would make the commute/drive of Albany residents easier? That it would ease congestion? Nick, no. The benefit is in keeping those outside of cars safer. If you actually read the piece you're commenting on, you'll see the traffic should improve in time. But if it doesn't, that's fine too, since we'll all be safer. As stated in the piece you're commenting on, this is a city, and you need to accept slower drives and longer travel times. Period. If you think traffic, noise, diesel fuel smell, loud car radios are bad now ,JUST WAIT UNTIL school starts, C.V.S. & Price chopper gets deliveries , I WARNED THEM. Told them to speak up, or suffer from the results!!! Former Albany resident here, who has since moved to Boston. Many projects like this happened in the Boston area over the past 3-7 years, and guess what, people didn't end up sitting in traffic for any longer than they already were. And now there are bike lanes, and people drive slower (okay, maybe not...). But my point is: if Boston, Cambridge, and Somerville can do this, Albany can too. As a resident who walks, bikes and drives the city, I'm excited for this improvement. As stated in the article, the speed limit is 30. Those complaining of a slow down are probably accustomed to 40-50 mph, speed easily an frequently achieved before. As a Lark St. area resident I'm anxiously awaiting phase 2 coming down into my neighborhood. I think APD should strictly enforce the speed limit and ticket reckless drivings. "So why do we care what deez non-residents think?" Um, because Albany isn't contained in a bubble? Many people use/enjoy the city, yet do not live in it. There is nothing wrong with that. Instead of turning this into the usual city vs. suburbs thing, let's focus on and discuss the merits of the project. I'm from the 'burbs and think the new lanes are a great idea. I agree with the sentiment that maybe things need to move a bit slower to improve overall safety and quality. I drive Madison quite a bit - and not just to speed downtown to my state job - and would love to see it become a safer place for bikes and pedestrians. Keep it on topic and on the issue people! I'm a daily commuter of this corridor and I prefer the new layout because I always go 30mph anyway and now I don't have to deal with jerks speeding past me or serving out at the last second from behind cars turning left. Any increase in time is worth the decrease in stress. Maybe because reconstruction of the stretch US route 20 known as Madison ave. is funded by city by 10-20 per cent? If my taxes are used to pay for that, I expect to have some say as well. I would like to see this extended all the way out to the uptown campus. More students, faculty, and staff would ride to work from Center Square, Pine Hills, etc. I know we've got rough winters here, but if Minneapolis/St. Paul residents bike year round, we can too. It seems like the perception of speed and time traveling is sometimes different than reality. I notice sometimes that "slower" roads that are well designed have higher average speeds and lower travel times than "faster" ones. It will be interesting to observe how the road diet impacts average travel times and speeds; I suspect the results might be counter-intuitive to the way it feels behind the wheel for some. "Maybe because reconstruction of the stretch US route 20 known as Madison ave. is funded by city by 10-20 per cent?" I was under the impression the rest is from state and federal grants. But that's fine. I want a road diet on Wolf Road then. Colonie will probably only pay 10-20 percent so my opinion counts just as much as a resident of the town. "Keep it on topic and on the issue people!" I think the mess we've gotten ourselves into by overbuilding for suburban commuters who treat us as target practice is exactly the topic and the issue. The road diet is a huge improvement. I usually avoided driving on Madison before because drivers would continuously weave back and forth between lanes, not know where one lane differed from the other and so they would be between lanes, people getting stuck behind left turners, cars driving too close the parked cars, etc. It was an utter mess. I am very pleased so far with the new road configuration. I bike to work every day and have not been yelled or beeped at by irate and unknowledgeable drivers ONCE since it's inception! Thank you for making it safer for me and others who do not drive cars! JayK - Right on !!!! I live in the neighborhood. I walk and drive by that section virtually every day. Walking is still quite dangerous. I stopped biking years ago because it was too dangerous. I used to bike to work. After getting hit a few times by idiot drivers I no longer feel safe. I love the new lanes, although I am baffled that the project simply stops around Ontario st or so. I cannot believe it was cost-effective to stop shot of doing the whole job. Driving westbound/northbound around the Point is taking much, much longer than it used to and I am trying to avoid that. Suburbanites need to contribute to the Albany city tax base somehow.